Thanksgiving Dinner, Timing is EVERYTHING! I took the turkey out of the freezer and put it into the refrigerator four days before Thanksgiving so that it would thaw thoroughly. I also kept an eye on it to make sure it was thawing. The day before Thanksgiving I got the turkey out, removed the giblets. I covered the turkey with plastic wrap and put it back in the refrigerator. The secret to an easy Thanksgiving is to prepare as many dishes as you can the day before. The day before Thanksgiving I cooked up the giblets in chicken stock with celery, onions, salt, pepper, and sage, just like my Mother and Grandmother did. I simmered this most of the day. This is the broth I used in the stuffing and gravy. It made all the difference in the world. I made both stuffings the day before and stored them in the refrigerator. Note: Do not put the stuffing into the turkey until you're ready to put it in the oven. I also made the White Chocolate cake, the Pearl Onion au Gratin, and the Cranberry Compote. That's five things off my list. My mother-in-law was making her dessert specialty, Strawberry Trifle and the mashed potatoes. My sister-in-law was making the sweet potatoes. That's eight things off my list for Thanksgiving Day. Pretty easy, especially since the peas, creamed corn and rolls only needed heating up, the jelly needed to be slid out of the can onto a plate. So I had to fuss with the turkey, glazed ham, candied carrots, green bean casserole and Madeira gravy. Thanksgiving morning. I knew the turkey had to cook 3 1/2 to 4 1/2 hours. It had to be out of the refrigerator 1 to 1 1/2 hours prior to going into the oven. It had to be ready by 4:30. So, the turkey came of of the refrigerator at 10:45A. The stuffing that went into the turkey came out of the refrigerator at 11:30A. I stuffed the turkey and put it into the oven at 12:15. 4 1/2 hrs of cooking would mean it would be ready by 4:30-4:45. Since I needed to take the foil off for one hour for it to brown, take foil off turkey was on my list at 3:30. We checked the temperature so we were sure the turkey was done. The thigh temperature should be 175 degrees and the stuffing 160-165 degrees. 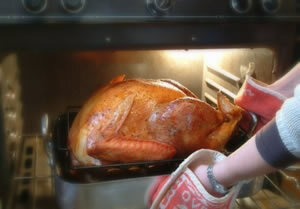 4:30P ........Turkey out of oven, out of roaster, cover with foil, rest 20-30 min. As you can see a lot was going on around 4:30 I had my sister in law keep watchful eye over the Madeira gravy after I started it and my mother-in-law carve the turkey and ham while I saw to the other dishes. I'm an admitted "A" type so I like lists and I like organization. I liked this list because I was able to relax knowing I was doing what needed to be done. I had plenty of time to relax and get the table set. I got all the serving dishes and serving utensils out. When my mother-in-law and sister-in-law walked in the door I know they were surprised how well everything was going. This really worked for me. I know that it can work for you. It's so simple. Figure out what time you want to have dinner and work backwards from that time. Every Thanksgiving since I've been married I've heard about the time my sister-in-law left the giblets in the turkey when she cooked it. I also hear about the time she forgot to cook the stuffing. I'm sure that in the years to come I'll make a few blunders of my own. What made this Thanksgiving so enjoyable for me was adding new dishes. That's definitely a tradition I'll continue. My nephew wanted to know if I had made that "green bean stuff" and was very happy that I had. He also tried a bit of everything - without being asked! As Thanksgiving approaches we'll be adding more of our favorite Thanksgiving recipes.